Tried and true soap recipe that can turn anyone into a soap making expert. 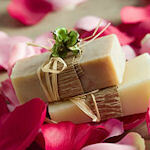 Featuring east to use instructions and the ingredients to produce approximately 100 4 oz soap bars. That's 60 cents a bar! And it is better for your skin. You just add the milk. Don't worry, if you don't have goat's milk, any milk will do. It's time to give soap making a try.